Who often plays or writes long letters on the home PC, knows the following Problem. The plastic keyboard squeaks at all corners and edges, buttons falling out or are not correctly recognized when pressed. This situation can be remedied. The classic rubber dome keyboards are working with little rubber bumps on the inside wich are closing a circuit on the PCB. But there is another Keyboard type, the mechanical Keyboard. The best-known model in this sector is likely to be the infamous IBM Model M.
The main feature is hidden behind each key - a mechanical switch. Market leader for these switches is the company Cherry with its Cherry MX series. The test today is about the Model S Professional daskeyboard from the company Metadot, USA. Because of the small box you can already guess what unfortunately nowadays is advertised with the terms "Clearly" or "Custom". The keyboard has a 2-year limited hardware warranty. The scope of delivery is limited to the essentials, including keyboard, a PS2-USB adapter, a microfiber cloth in black and a small leaflet. When unpacking you realize immediately that this keyboard is much heavier than its competitors. 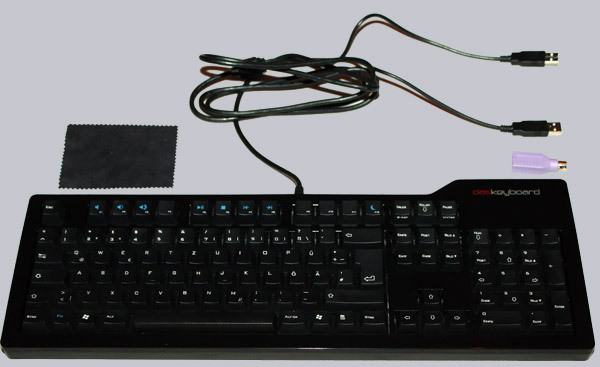 The weight of the keyboard is about 1150 grams, which ensures that the Keyboard remains in place even in hectic typing. The dimensions are 45.7 cm wide, 16.5 cm deep and 2.7 cm in height. 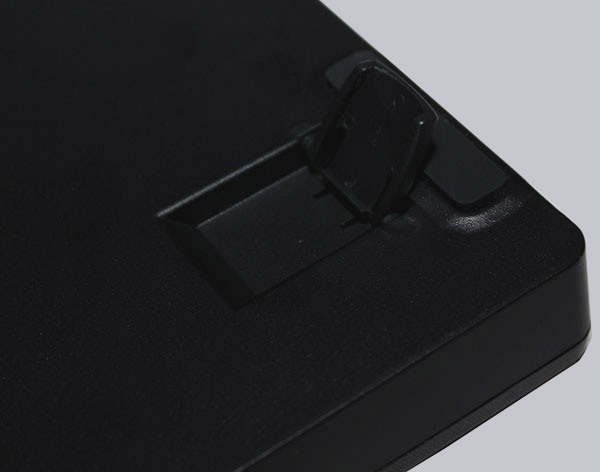 Unfolding the two bottom-mounted feet, the keyboard can be raised resulting in a height of about 40 mm. activating special functions such as Caps Lock, Num Lock or roles. 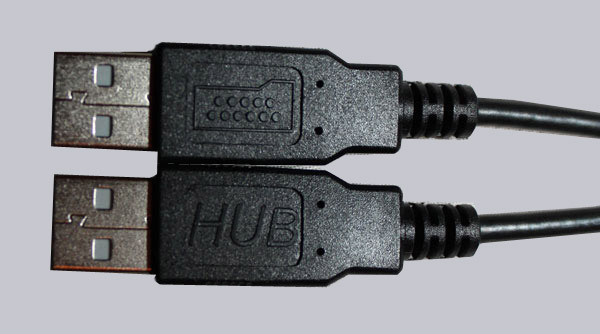 In the middle of the Keyboard a USB cable is attached, which has a length of about 2000 mm, and divides into two USB connectors at the end. One of them is used to power the keyboard and transmitting data to the PC. 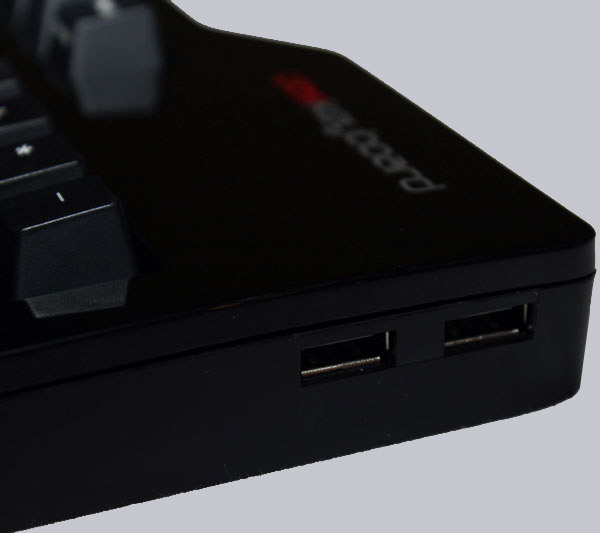 The other connector provides power and Data for the integrated passive USB hub, which provides 2 USB 2.0 ports on the right side of the keyboard. It should be ensured that only devices under 500 mA are connected. The keyboard uses the standard layout for keyboards. 105 keys are fitted in the DE version. The F-keys accommodate some special functions that can be used together with the FN key. It is the mute, volume up and volume down function, as well as play, stop, forward, back and the sleep mode. 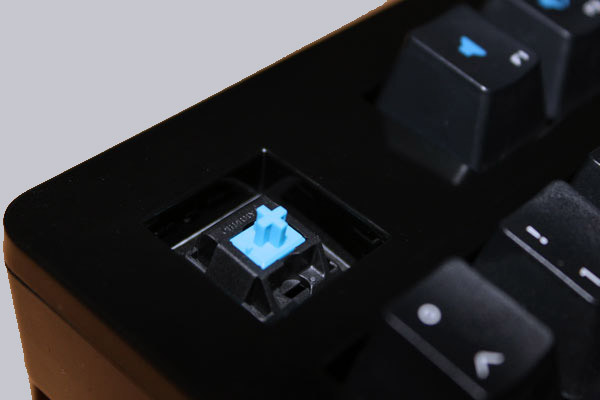 The model tested is the Professional Edition with Cherry MX Blue switches, which means that the keys are labeled and there is a blue MX-Key among them wich have noisy and tactile Feedback. Also available on the market is the Ultimate version which has no labeled keys. This is only for correct 10-finger Typers and can also be optionally ordered with MX Blue, Brown MX or MX Red switches. As already mentioned, this is the switch giving a loud "click" at approximately half of the way closing the contact. You can also feel this point and know exactly if and when you have pressed this button. loud typing noises are not allowed. These switches have a linear, non-tactile switch point and thus no clicking sound. But they are also not very quiet, because actuating the buttons still makes noises. Looking at the surface of the keyboard some may groan again and say, "No, not again piano lacquer ...". 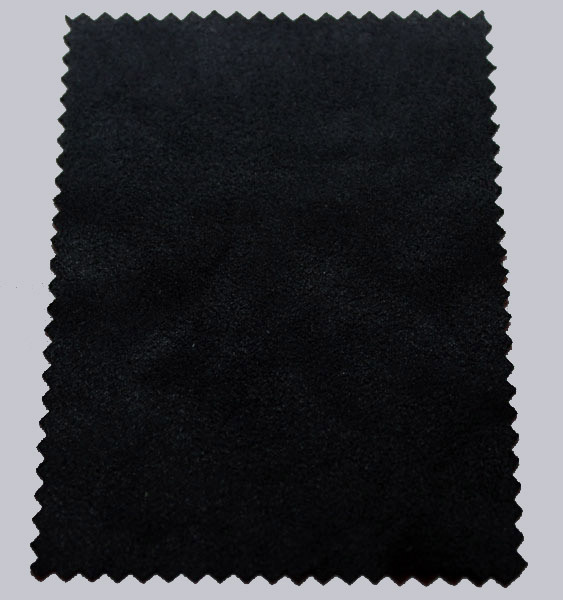 The advantages are obvious: While you can not easily clean rubber or plastic-coated keyboards, piano lacquer coatings can be wiped off easily with the included microfiber cloth. Also, you could say it gives the keyboard a sophisticated feel and fits well onto the gamers desk. The opponents argue here with experience. Piano lacquer makes scratches real visible. When Unpacking the keyboard looks new, but gains by jewelry / watches, etc. hundreds of scratches after a short time. Also smart users see through the tactics let somewhat "cheap " look noble by equipping it with a piano lacquer finish. It's more or less just a matter of personal taste. As expected, the keyboard is very loud when typing. 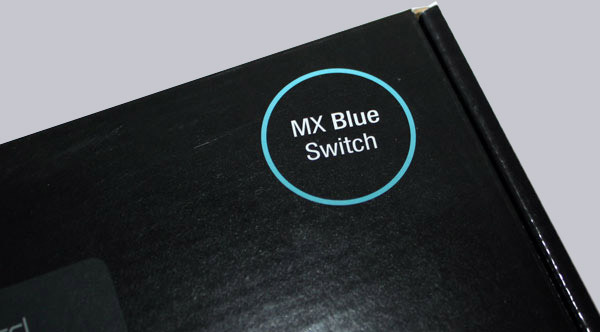 Everyone who is thinking about buying this Keyboard with MX Blue Switches should be aware of that. Typing is very easy on the hand and makes due to the tactile and audible feedback fun. Metadot has unfortunately failed to equip the Keyboard with massive high quality stands. The risk persists that the stands can break off as they are fixed with only two retaining lugs. Here interchangeable rubber feet would have been the better choice. The first time to play with this keyboard is likely difficult for the experienced Rubber Dome User. It is always hard to overcome those little resistance, which is then readily acknowledged with a "click". But you get used to it after a short time and just enjoy the benefits of such a keyboard. Those who wonder now why no sound examples are presented here, let me tell that a faithful recording of the keystroke is difficult. The best test is to visit your local dealer and try it out a few minutes and then decide whether you can live with the noise or not. If you are tired of cheap keyboards, and would like to have a solid keyboard that gives you the impression to be back in 1989 and typing with an old Model M hundreds of lines of code in QBasic can obtain the dasKeyboard carefree. we now want to give you a long-term experience with the hardware previously tested. It is intended to serve you a taste of the durability and the usability over a long time. Should it be necessary, we will of course also post some photos. Below are some useful informations about the useful life and intensity of usage. Because of the massive shape of the connecting cable no damage is found around here. As expected, the buttons are not subject to any noticeable wear. The keys do not squeak and every key has still the keystroke according to regulations. Despite the piano finish the keyboard looks, after cleaning, still very good. What is of course also due to the careful handling.